This post was written by Nick Maglosky, CEO of ecomdash. Ecomdash is a smart, multichannel inventory, order, listing and shipping software for online retailers. Nick is passionate about small to mid-sized businesses and all things ecommerce, and enjoys researching innovative ways retailers can compete online in an increasingly diverse market. Inventory management is crucial for all ecommerce retailers. Unfortunately, many retailers aren’t doing it right. In fact, retailers lose over $1.75 trillion dollars a year due to poor inventory management, including overselling. The best way to effectively manage inventory will be unique to your business. What works for you may not work for other ecommerce companies. But, there are some strategies that are beneficial for all retailers – those that help improve your inventory management and increase cash flow. 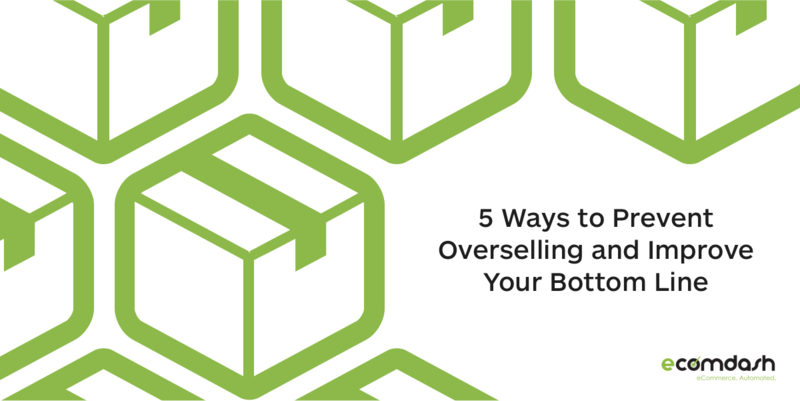 Here are five ways to prevent overselling in your ecommerce business and to keep yourself out of those staggering statistics. The standard level for a product is the minimum quantity of product that you must have on hand at all times to take care of orders. When stock goes below the standard level, it’s time to order more inventory. When you place an order for additional inventory, you’ll want to order the minimum amount to put the product above the standard level. When you are calculating the standard level for a product, be sure to keep in mind how quickly the item sells and how long it takes to receive inventory from your suppliers. Although it will take some work on the front end to set all your standard levels, it will save a lot of time and will help prevent stock outs – and dissatisfied customers. Check your standard levels quarterly, as things are ever-changing in the world of ecommerce. The products that are your best-sellers now may not be in a few months. “First-in, first out” is a simple concept. Your oldest inventory (first-in) gets sold first (first-out), not your newer stock. This concept is crucial if you sell anything that is perishable, so you don’t end up with expired or unsellable items. It’s also important to use the FIFO method with non-perishable inventory. If the same products, boxes, and packaging are sitting on the shelves for a long time, they will get worn and not look fresh. Additionally, suppliers may change product packaging over time and you don’t want to end up with stock that is obsolete that you can’t sell. If you use a fulfillment company, it’s likely they already practice FIFO, but it’s worth checking with them to confirm. Planning for contingencies can save you a lot of time and headaches. Issues with inventory management can pop up when you least expect them, and when they do, they can devastate your business if you are not prepared. It’s really not a matter of if these scenarios occur; it’s a matter of when. Consider the issues that could come up, and plan for how to handle them. When you have a plan, you can make a potential disaster no more than a little hiccup that is easily managed. Regular reconciliation of your inventory is important. You’ll likely use software and reports from your warehouse to know accurate inventory levels. But, it’s still important to make sure your reported numbers match the actual quantities of stock. There are several ways to do this. Physical Inventory – This involves counting all inventory at once. Many businesses only do this type of audit annually, but that can make it hard to reconcile any discrepancies. Spot Checking – Spot checking will help you stay on top of discrepancies. It involves doing a check on specific products throughout the year. It’s not typically done on a schedule and it should be used along with an annual physical inventory. Cycle Counting – Rather than doing an annual inventory, certain products are inventoried on a schedule throughout the year, so that all items are inventoried within a 12-month period. Consider other things that may affect sales so you can come up with an accurate forecast of future sales. When you take control of inventory management, you’ll know exactly how much inventory you have, accurately forecast, and prevent overselling. Not only will this ensure that you don’t lose any sales, but it will also help increase your bottom line.